It's that time again to show you what I created for MC # 22!! This week's concept is another interesting one (well, I never get bored with their concepts) ... but unfortunately I did not use all of them. 1. 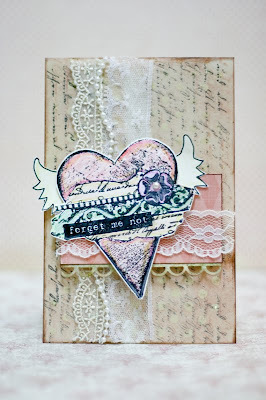 I embossed the background using a polka dot stamp. 2. I also stamped using script stamp once the embossing is dried. I used black Staz On ink for a contrast look. 3. Distress the white cardstock using blending tool. Remember to drop by the blog, take a peek & start creating because you might win this month's RAK by My Stamp Box!! 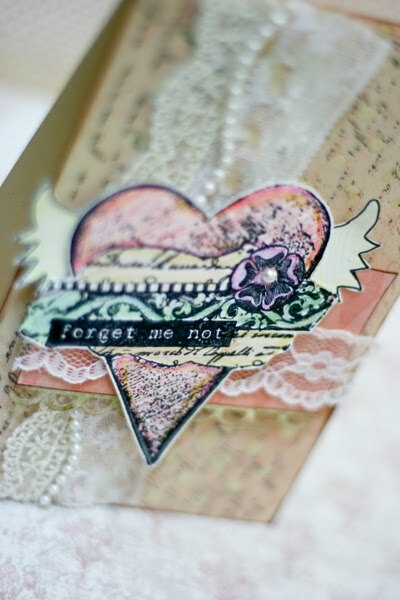 Love the distressed look of this, love that vintage feel too! your cards are amazingly gorgeous. :) tfs! That card is entirely too ooooo precious, lovely stuff!! This card is so cool! LOVE the heart and the script background. Fun! WOW! What a gorgeous card babe!! I love the distressing a lot especially the background! it'sw like a piece of art to me! Shabby chic but with an attitude ! Admire how you achieve it. Come do the Happy Dance with me!! Vintage Bride & Other Updates!